Florida's World Quilt Show in West Palm Beach is a great event to attend, amidst the warmth and sunshine, while most of the U.S.A. shivers under winter's blanket. We marveled at all the spectacular quilts from around the globe! Planet Earth indeed holds a huge variety of wonderful quilting talent. We're happy to be sharing this series of photos from Florida. Catherine states,"2014 is the centenary (100th anniversary) of the outbreak of the First World War. I was inspired by the last lines of a poem by John Macrae (who died of war-related illness in 1918), 'If ye break faith with us who die, We shall not sleep, though poppies grow in Flanders Fields.' " The poet was speaking of the red poppies which grew among the graveyards of soldiers in the Flanders area of Belgium. The red poppies are a symbol for Remembrance Day which is celebrated each November 11 in the United Kingdom and the Commonwealth Nations, as a tribute to members of the armed forces who died in the line of duty. Catherine adds, "The symbolic poppy is made in circular bargello pattern on a background of patchwork fields, some growing crops, some mud as in the battlefields." Catherine has created a heartfelt and radiant tribute in the form of a giant poppy, done in varied shades of red, orange, and rose. Rahel notes that ISabella (with first two letters deliberately capitalized) is machine pieced and machine quilted. It appears to be a modern, abstract art quilt of human face, in the style of painter Pablo Picasso. If you look closely for awhile, you'll be able to find ISabella's hair, eyes, nose, mouth, and perhaps her eyebrows. We nicknamed this fun quilt "the red lips quilt", because ISabella's mouth is so prominent. 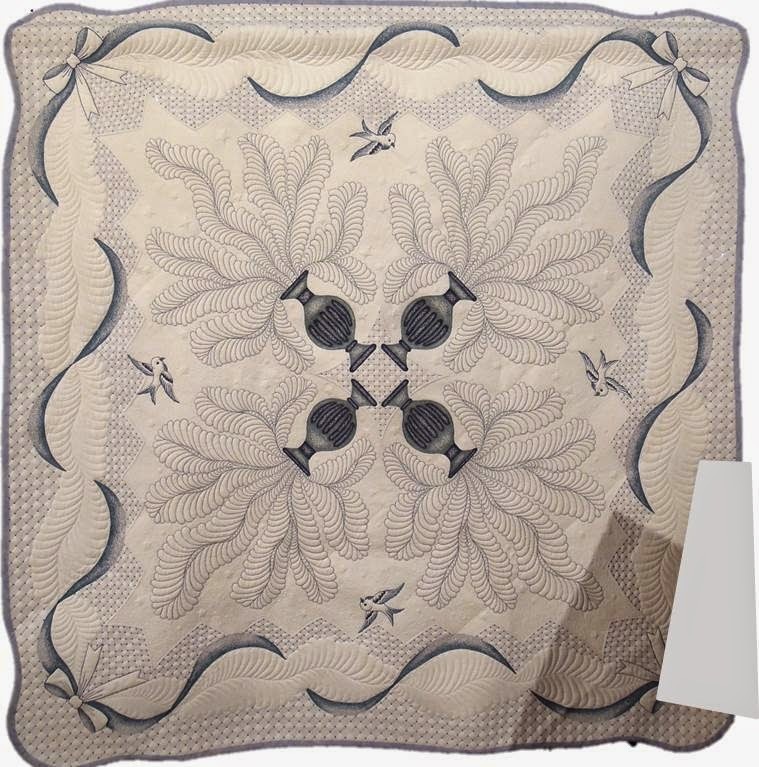 Note the straight lines of quilting which provide structured contrast to the random curves and circles of this whimsical, lighthearted design. Denise writes, "My inspiration comes from Australian native flowers and my beautiful Mum, as this is the last quilt she has seen before she went blind. I use a technique I call "Baglique", a very easy way to applique without having to turn edges... I use a mixture of hand dyed and commercial fabrics and shade the piece with Neocolor II watercolor pastels." These giant flowers are so overwhelmingly cheerful, that they would brighten up even the darkest winter day. The beautiful pink and rose tones are a great complement to the medium and dark green stems. Denise's original design is hand and machine appliqued, machine pieced, and machine quilted. We admired the pretty embroidered embellishment on the leaves and blossoms. This quilt reminds us of a safari across the plains of Africa, with its artistic animals and its resplendent earth tones. May-Gene says, "The design was inspired by "Storm Over Africa" by Jenny Williamson from her book Quilt Africa, co-authored by Pat Parker. The quilt center was constructed from half-square triangles, with a machine appliqued border of African wild animal silhouettes. "Sunset Over Africa" was made.... to be auctioned off at a fund-raising event with a "Proudly South African" theme. My husband bought the quilt, he loved it so much!" Hiroko explains, "I made this quilt to express my gratitude to my father-in-law, who was gentle, yet strong as a tiger. It is machine pieced and appliqued, hand quilted, embroidered, and painted." This is a strikingly interesting quilt, with a vibrant background. Hiroko has created wonderfully realistic expressions on the faces of the tigers. She has embellished their faces with whiskers made from clear monofilament, which enhances their life-like countenances. Let's Do The Dresden Twist by Teri L. Cherne, U.S.A.
Blue ribbon winner for Best of Country award -- U.S.A., Terri writes, "So much fun! All the wide open space made for great play time!" Terri's Dresden twists, done in vibrant polka dot fabric, are an original design, which is hand appliqued, machine pieced, and machine quilted. The outer border of alternating scallops and points adds a vibrant energy to this creation. Look at the large variety of contemporary quilting patterns here. We love the bubbles interspersed with the wavy lines. 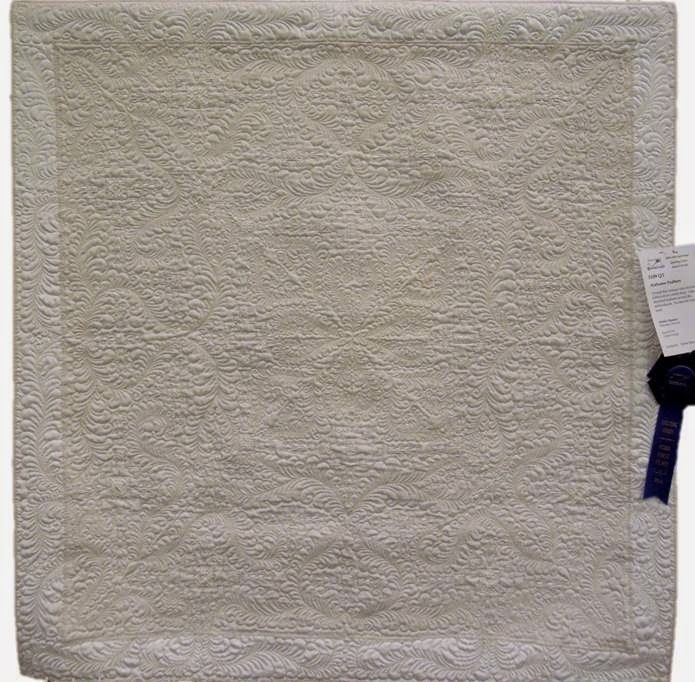 Blue ribbon winner for Best Hand Workmanship- Innovative Quilts, Kazue notes, "Blue sky in the summer and colorful flowers. The flower fairies enjoy this! The quilt is finished with embroidery and applique. " In this delightful quilt, the little fairy is all dressed in lavender, with mint green accents. We love the charming daisies which adorned her wrists and headband. All in all, this scene is so adorable and colorful. Kazue's original design is machine pieced, hand appliqued, and hand quilted. We've never shown a quilt from Brazil before, so were thrilled to see this one at the show. Here's another tiny fairy-like figure, no doubt dancing an energetic samba, with a flower bud for a hat. The quilter writes, " I always have wanted to dress myself as a flower, especially when my mother used to take me to Holambra, a city close to Campinas, Soe Paul, my city in Brazil. It is very famous because of the first class flowers that are produced there. I had the opportunity to go there several times and have very much enjoyed those visits since I was a little girl. " Maya states, "The beginning of a new quilt is a mysterious adventure for me, of which I don't know the end. Life is also a mystery to us; that is the beauty of it." Maya Chaimovich is the author of the book, Simply Creative Quilts. You can read a review of her art quilts at The American Craft Council. We resisted the temptation to touch this quilt (as we always do). However, these rich, color saturated violets and rose tone shimmering fabrics with their various textures really appeals to one's tactile senses. Maya's work is machine pieced, machine appliqued, and machine quilted. Sheila explains, "The idea for this design was sparked after I had spent some time looking up the still life quilts of abstract artist Dominie Nash. I photographed and sketched a still life which I had set up and then followed with a collage process in fabric. First, I pieced and layered a background with cottons, organzas, chiffons, and tulles; then fused on the still life elements and finally embellished the work with machine quilting." Strong angular lines of this sophisticated, very enjoyable creation provide a contrast to the circular curves of the coffee pot and the fruit. In this close-up, you can see some of the tulle netting fabric that Sheila used for embellishment. Kate says, "My quilt is inspired by the 2007 Block of the Month "Ribbons and Blooms" by Beth Ferrier at Applewood Farm Patterns. I pieced the blocks on my sewing machine and also joined the blocks by machine. All applique work and the quilting have been done entirely by hand. I used all batik fabrics." We enjoyed all this fabulous hand applique and hand quilting. Lavenders, pinks, and fuchsias contrast so prettily with the bright orange-yellow ribbons and sunburst blocks next to them. ( See larger photo). Kate has done a superb job of color selection here. Matsuko says, "This quilt is made from a traditional Japanese bridal costume. I want to express of feeling of Miyabi through this quilt. Miyabi is a feeling of elegance and sorrow. To represent [Miyabi], I reformed the log cabin pattern to a rose shape and expressed sorrow through my color choices. Weddings are ceremonies that have these two emotions." Matsuko's stately and elegant kimono pattern, all done in silk, is almost 9 feet long- one of the tallest quilts we've ever seen in a show. Matsuko adds about her original design, "I hope these rose pattern [blocks made out of ] wedding dresses expressed these emotions well." This stunning work is machine pieced and machine quilted. Blue ribbon winner for Best Use of Color-Traditional Quilts, Hazel writes of her original design, "[This quilt was] inspired by a photo taken in India of stonework on a heritage building. The quilt uses the bright colors of the women's saris to evoke the energy and vibrancy of India. " Through subtle yet stunning gradations of hues, Hazel's work is spectacular. Hazel continues, "The flower motifs are mainly silks with shot cottons, cut on the bias for the trellis work. The piece is machine applied and machine quilted with hand embellishment in the center." For more information about Hazel Foot, please see her biography for the 2015 Quilt Symposium Manawatu. Blue ribbon winner for Best of Country (Israel), Shani notes, "Watching these three brothers, listening to their music and their laughter, I was captivated by the energy that flowed between them.... It brought to mind the biblical story of Joseph searching for his brothers and for brotherhood...."my brothers I seek". Shani created her original design with machine raw edge stitching with zigzag stitch and machine quilting. She used pastel crayons to enhance the face and the hands. We admire the thread painting, which adds so much to the ethereal light and shadow effect of her work. Jocelyn notes, "Both [of my] grandmothers and my sister plant flowers. I sew them, planted in a trellis border fabric. The back is pieced from fabrics bought with the border for a quilt top." This split complementary color scheme, with its radiant periwinkle, lavender, and yellow-gold tones, creates a lovely floral bouquet pattern. Jocelyn adds, "[These] flowers are hand sewn and machine quilted with guidance and help from Sharon Perry, who designed more hexagon patterns especially for this quilt. We used a computer-driven longarm machine owned by Sue Burnett, who gave us the use of it." Jocelyn's work provides a cheery and colorful touch of springtime to the viewer's eye. In this close-up photo you can see the fussy-cut hexagons that make up the "flowers". The quilt reminds us of a one-block-wonder combined with a Grandmother's flower garden design. Fireball, 48 x 48", by Candice L. Phelan, Florida, U.S.A.
Of her original design, Candice explains, " [This is] fourth in a series of luminescent spheres." Candice started with the lightest fabric, the white highlight, then worked outward to the deeper orange tones. In Candice's You Tube video, she provides an excellent explanation of her fascinating work. Candice continues, "It is machine raw-edge appliqued, thread-painted, and machine quilted, using variegated, metallic, and iridescent threads." She used over 3,300 pieces of 1 1/8 inch fabric circles, hand-dyed in 8 different hues. This is one of the most innovative and original creations we saw at the World Quilt Show. Whole cloth quilts, done in icy white or pale pastels, remind us of winter. Here is the second part of our series. Capturing the texture of quilting in a photograph is really challenging, especially with white-on-white quilts. We hope that our photos will convey some sense of the magnificent quilting by these artists. 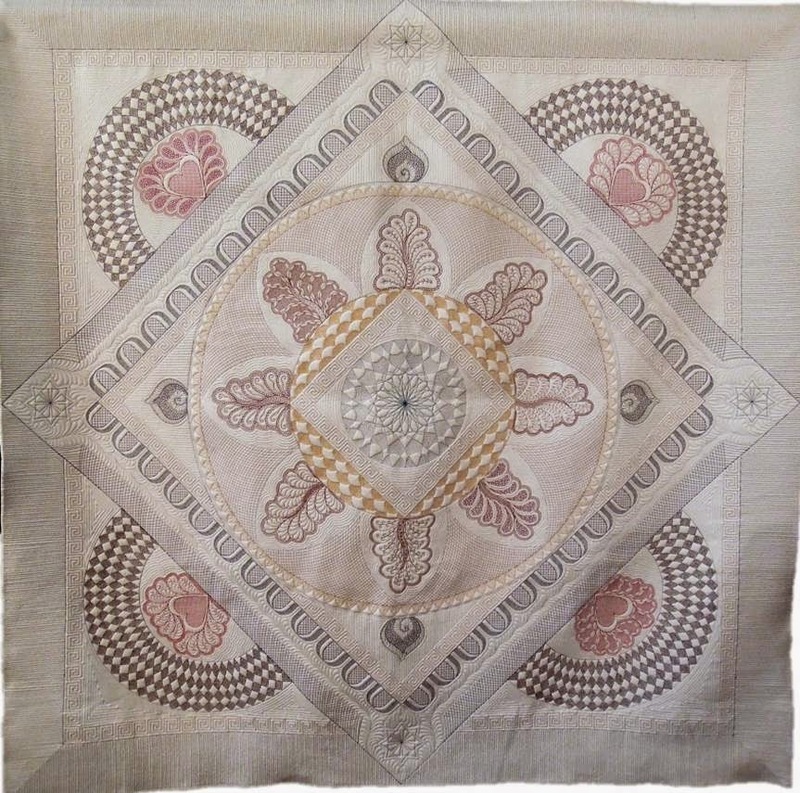 Ann writes about her original design, "A wholecloth designed to represent many different quilting styles, each round is dedicated to a different friend's taste. I wanted to use as many longarm rulers as possible. My challenge was to keep the quilting looking cohesive throughout the quilt." Look at the fabulous variety of feather patterns that Ann created. Each one is unique, yet they all fit perfectly into the overall design. In this close-up you can see Ann's precision work on the "Greek key" style quilting motif which adorns the diamond-shaped center medallion. Rebecca notes, "This wholecloth was inspired by my blue and white china collection, as well as my quilting heroes Libby Lehman, Sharon Schamber, and Sue McCarty. I have combined all the things I have learned from them to make my quilt." Rebecca's techniques for her elegant, vintage-inspired creation include free-motion longarm machine embroidery, hand-guided longarm quilting, and corded binding. For materials, she used cotton fabric, metallic thread, Superior Bottom Line thread, and hot fix crystals. Bella Be Blue is Rebecca's original design. In this close up, you can see one of the four darling little birds that appear to be floating and drifting through each side of this quilt, as well as the glittering embellishments that adorn the inner borders. Inger writes of her lovely original design, " This whole cloth quilt was quilted on my Bernina 820 on constant speed, without the stitch regulator engaged. 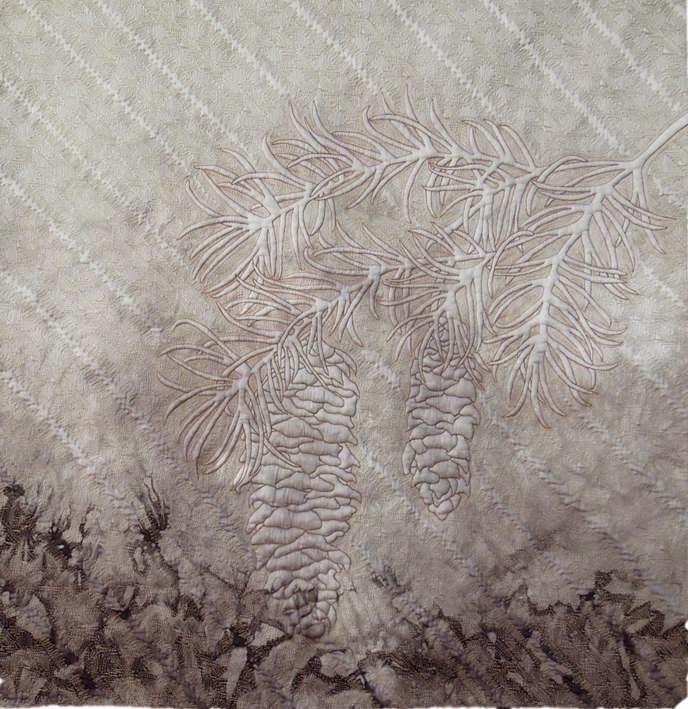 It was [first] dawn out by pencil on paper, quilted, then painted after the quilting was completed. " Inger continues, "[My] inspiration was a National Geographic TV program about Alaskan glaciers. I was fascinated by the color of the ice. This quilt is # 2 ( winter) in a series of four. Blue Ice was displayed at the 2014 Pacific International Quilt Festival in California, where it attracted many admiring viewers. Look at this gently scalloped outer border, whose curves mirror the half-fans of the inner border. Hundred of sparkly crystals really add shimmer to this quilt. Jane notes, "This is my completed project for my Craftsy.com class, "Beyond Basic Machine Quilting", taught by Ann Petersen. This was my first serious attempt at free-motion quilting". We think Jane did an outstanding job at creating this elegant depiction of a spring flower garden, replete with a charming dragonfly. Whole cloth quilts, done in icy white or pale pastels, remind us of winter. We've never done a feature on whole cloth quilts, perhaps because capturing the texture of quilting in a photograph is really challenging, especially with white-on-white quilts. We hope that our photos will convey some sense of the magnificent quilting by these artists. 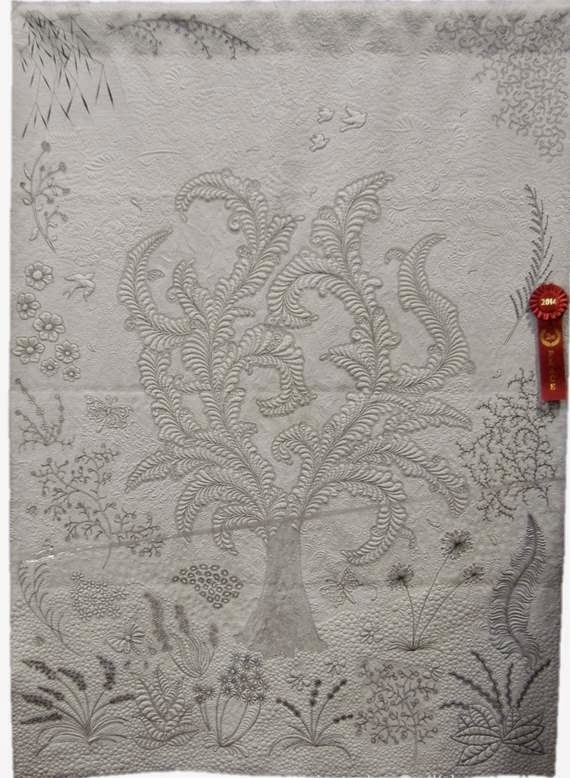 An Honorable Mention winner at the 2013 Houston International Quilt Festival, Laurie notes, "I designed this quilt after being snowed in for five days, due to impassable roads, on Whidbey Island, [in the state of ] Washington. One gets to contemplate winter at its best -- clean, pure, and beautiful." For her original design, Laurie's techniques include cut-away trapunto and free motion background stitching. The cotton sateen fabric is hand-dyed, with poly batting for trapunto. Her use of deeper colored cotton thread really helps the viewer see the details of the barren, graceful branches. Jenny writes, "I love my Northern California landscape-- it gives me daily joy. The slightest breeze brings movement to the grasses; bees, humminbirds, and dragonflies are frequent visitors. I wanted to capture the beauty and texture that I enjoy on the daily morning stroll through my garden,"
Jenny's lovely work is free motion quilted, with cotton sateen, wool batting, cotton, silk binding, and cotton and silk thread.She won the second place award for Most Innovative Quilt at the 2014 Road to California Quilt Show. We really liked this magical butterfly and other animals outlined in deeper colors, which float through the windy sky and add to the sense of continuous movement. 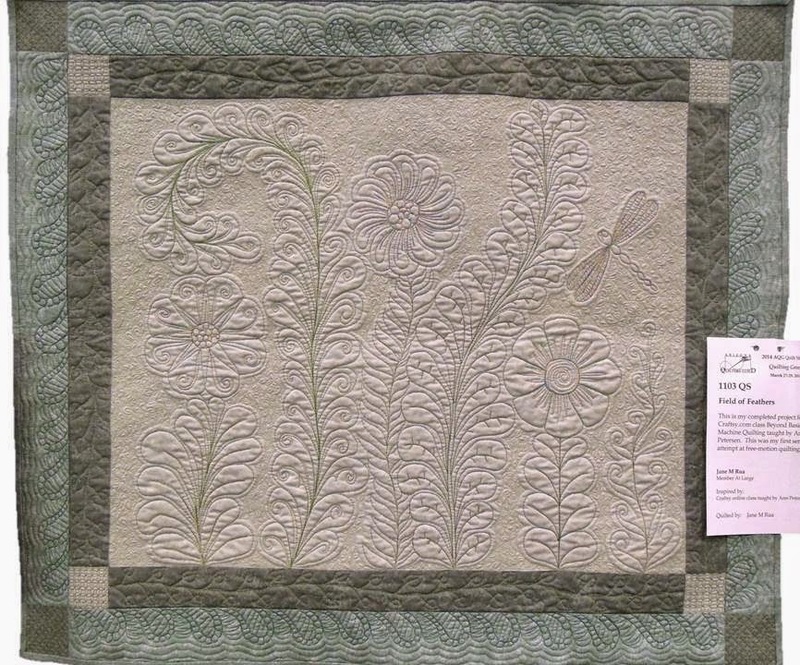 A blue ribbon winner in the "Quilting Green" category at the 2014 Arizona Quilters Guild Show, Debbie states, "I found this vintage cutwork linen tablecloth in a thrift shop. I hand-sketched feathers around the embroideries. No stencils were used. 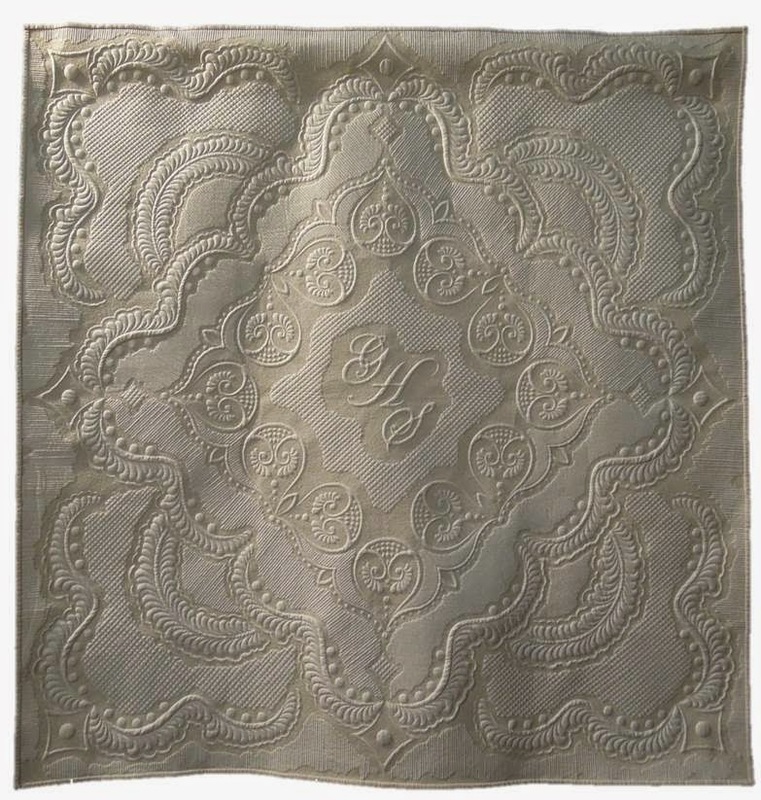 These quilted swirling feathers perfectly enhance the antique, elaborate look of Debbie's enchanting original design. First place winner in the Best Machine Quilting category at the 2013 Houston International Quilt Festival, Lisa notes, "My father, George Swan Hagstoz, Jr., passed away in October of 2011. This quilt is my tribute to him. His initials are in the center, with 12 teardrop motifs surrounding them. These teardrop motifs represent his wife, three children, and eight grandchildren." Lisa's strikingly beautiful original design is enhanced by the occasional rows of straight, parallel quilting lines. They provide a pleasing contrast to the delicate teardrop motif symbolizing the members of her father's family. Theresa explains, "This quilt was designed paper, transferred to the fabric, quilted, and bound. After binding, it was hand-dyed, and Shiva Paintsticks were applied to the entire top. " These elegant, intricate circular motifs seem to us to be inspired by the work of master artists of the Italian Renaissance. 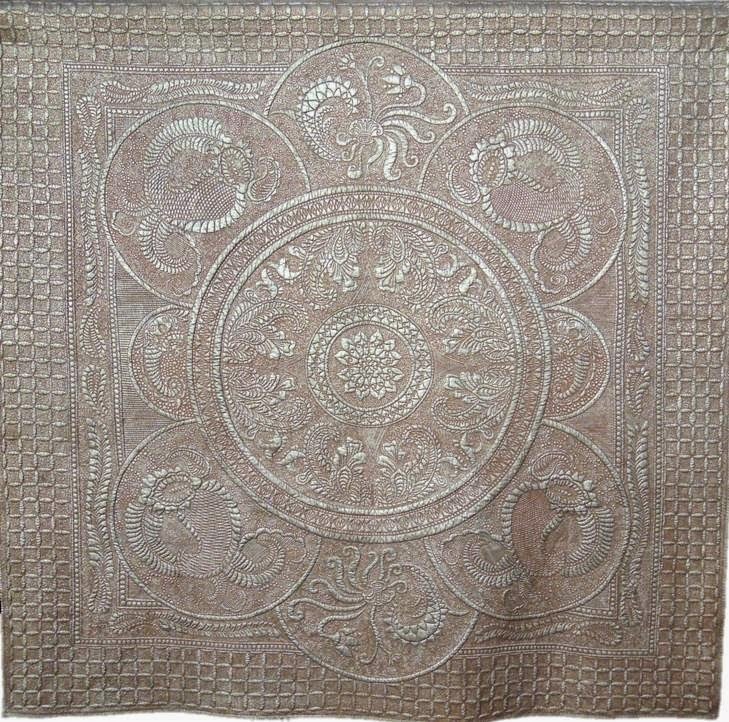 The motifs really catch the viewer's eye and draw it towards the ornate center medallion. Theresa's intriguing original design is created with cotton sateen fabric, Hobbs wool batting, and Superior thread. Shiva Paintstiks give a luminous iridescent patina to her work.